The summer might be coming to the end, but swimmers out there might want to take a dip with the new Apple Watch. 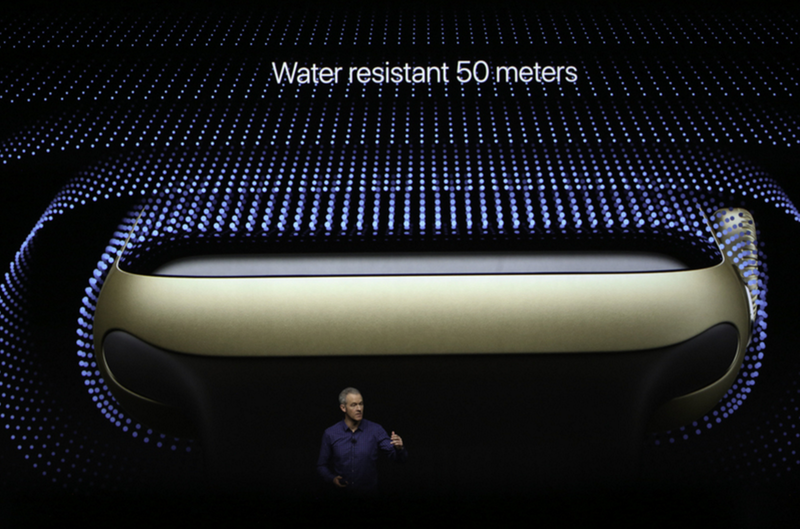 At Wednesday’s Apple event broadcast from the Bill Graham Civic Auditorium in San Francisco, the tech giant announced that the new Apple Watch Series 2 is water-resistant. To the sound of cheers, Apple’s Chief Operating Officer Jeff Williams announced that the latest version of the watch would be water-resistant up to 50 meters and will also contain a built-in GPS. “The first Apple Watch was splash proof. Apple Watch Series 2 is swim proof,” Williams said at the event. On CNET’s live blog of the event, Scott Stein also commented that it’s “kinda crazy” that the watch’s speaker ejects water if it starts to fill up. Social media users responded positively to the news. The Watch will retail at $369 and will be available for pre-orders starting Sept. 9, 2016. From swimmers to runners, Apple further emphasized its appeal to athletes, with the announcement of the Apple Watch Nike + Edition. The Nike aluminum watch comes with a custom watch face and perforated rubber band. The special Nike watch features a shortcut to start a run that can be activated through Siri and accessed on its watch face. The sports-friendly watch displays a runner’s distance traveled and pace. It’s also interactive. The watch ties in with the Nike+ Run Club, which offers suggestions for days that would be good for runs with friends as well as a look at the day’s weather. Tired from all that swimming and running with your watch? If you want to take a break from your workouts​, the Apple Watch Series 2 also features a “mindfulness app” called Breathe.